A crafty Black Bear was able to open the door to the Stanley Hotel in Colorado and rearrange the furniture in the lobby while over 300 guests were asleep in their rooms. The world-famous hotel is best known by horror fans as the place that inspired Stephen King to write The Shining. The whole uninvited guest incident was caught on tape by the front desk supervisor late at night and shows the bear investigating the lobby while standing on a table and looking around. Thankfully, no damage was done and he didn't try to get to room 217. The Stanley Hotel is located in Estes, Colorado, which is about 5 miles away from the Rocky Mountain National Park. General manager Reed Rowley stated that they're used to living with the wildlife since the hotel is so close to the national park. Rowley also notes that the bears around the area are pretty smart and indicated that it's not the first time that a bear has tried to get a supernatural tour of the lobby. The bear was respectful and really only broke the rule of jumping on the furniture. Stephen King stayed at the Stanley Hotel in 1974, which was built in 1909, with his wife. The author recalls that he and his wife stayed at the location when they were about to close for the season, making them the only guests in the entire place. It was during this stay that King came up with the idea for The Shining. From the eerie empty hallways to sitting alone in a dining area and listening to canned classical music, the seeds for the novel were planted. King explains. "I dreamed of my three-year-old son running through the corridors, looking back over his shoulder, eyes wide, screaming. He was being chased by a fire-hose. I woke up with a tremendous jerk, sweating all over, within an inch of falling out of bed. I got up, lit a cigarette, sat in a chair looking out the window at the Rockies, and by the time the cigarette was done, I had the bones of The Shining firmly set in my mind." While the Stanley Hotel inspired The Shining novel, Stanley Kubrick's big screen adaptation of the movie did not take place there. Instead, the director shot exterior shots at the Timberline Lodge on the slopes of Mt. Hood in Oregon. The interior shots of the film were shot at Elstree Studios in England. However, the 1997 TV series of The Shining was shot on location at the Stanley Hotel. Room 217 in the Stanley Hotel is officially the Stephen King room, which is apparently a "hotbed for paranormal activity." In Stanley Kubrick's The Shining, the room was changed to 237 because the Timberline Lodge didn't want people to be afraid of taking room 217. The lodge now indicates that 217 is their most requested room. 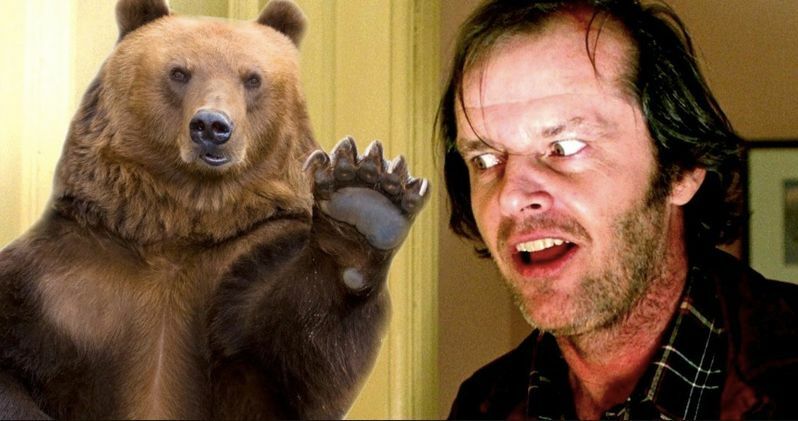 It's not clear if the black bear that entered the Stanley Hotel the other night was looking for room 217, but he didn't get past the lobby and left on his own. You can check out the bear visitor below, thanks to the Stanley Hotel Facebook page.